US research has raised hopes of developing a drug therapy to reverse the learning problems associated with Down's syndrome. At birth children with Down's syndrome are not developmentally delayed, but memory problems often mean they soon tend to fall behind. The new study, in mice, pinpoints the key defects in the brain, and suggests a possible way to tackle them. 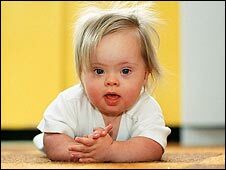 Down syndrome is a genetic disorder caused by an extra copy of chromosome 21. It is often associated with deficits in the memory centres, making it difficult for the brain to collect and make use of experiences in a way necessary to form new memories and underpin the development of learning. In the latest study researchers from Stanford University and the Lucile Packard Children's Hospital - both located in Stanford, California - worked on mice genetically engineered to mimic Down's syndrome. Unlike other mice, the genetically engineered animals, when placed in a cage with which they were unfamiliar, failed to start building new nests. The researchers showed that cells in an area of the animals' brain called the hippocampus were starved of a supply of a chemical called noradrenaline, which helps nerve cells to communicate with each other. The problem seems to be due to the deterioration of another area of the brain called the locus coeruleus, which usually communicates with the hippocampus during the formation of memories. It seems that the copy of the extra chromosome carried by people with Down's contains a specific gene - APP - which spells trouble for the locus coeruleus. The researchers found that when levels of the chemical were artificially boosted, it had an almost instant positive effect on the animals' behaviour - they started nest building, and improved their performance on other tests too. Drugs that target the noradrenaline system have already been developed for depression and attention deficit hyperactivity disorder (ADHD). The researchers say their work suggests they might also help people with Down's syndrome. They suspect the most fruitful approach might be to focus in tandem on noradrenaline and another brain chemical which has been implicated in Down's syndrome, called acetylcholine. Lead researcher Dr Ahmad Salehi said the study suggested that an early intervention with the right drugs might help children with Down's syndrome to collect and make sense of information. He said: "Theoretically, that could lead to an improvement in cognitive functions in these kids." Dr Melanie Manning, director of the Center for Down Syndrome at Lucile Packard Children's Hospital, said: "It's very exciting. "We still have a long way to go, but these are very interesting results." Professor Tony Holland, an expert in learning disabilities at the University of Cambridge, said: "This type of research offers the possibility of understanding the problems that can arise in the brain as a result of inheriting an extra copy of chromosome 21. "This is turn could lead to targeted and rationale therapies. However, whether such treatments are safe and effective in humans and whether they can have significant effects on function and bring longer term benefits is a very different matter." Carol Boys, chief executive of Down's Syndrome Association said: "There is a great deal of research being done in this field, mainly in the US and we are following progress with interest. "However, it will be quite some time before any of these treatments are available and safe for use with human beings. "There is much that we need to understand about the genetic makeup of people with Down's syndrome."